Former MLA of Tali Constituency, Takam Sorang, have submitted a representation to Chief Minister Pema Khandu on request him to consider allocation of Rs 50-60 Crores from Revise Estimate (RE) fund 2017-2018 for construction of Yangte-Tali road for construction and smooth completion up to Kumey bridge point. The chief minister committed the same in a public meeting which held at Tali on 30th October 2017 in presence of Kiren Rijiju , Union Minister (MoS Home) and Tapir Gao president BJP state Unit, Sorang reminded. Talking to Arunachal24 over phone , Sorang explain about his tour during which he inspected the Yangte-Tali road on 24-25th of this month and held several awareness public meetings at various villages along the road and highlight initiative undertaken by Pema Khandu lead BJP govt to allocate fund for above road project. He also said that, during his tour he also appealed all sections of public to cooperate with the Deputy Commissioner and Executive Engineer PWD division Tali and not to disturb them during execution of work for smooth and hustle free completion of this road project under the control of Pige Ligu the Deputy Commissioner Kra-Daddi district and Er. Bamang Raju EE PWD Tali. 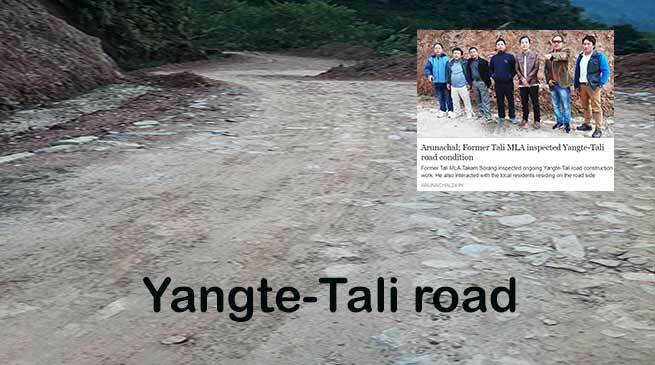 ” As per my inspection findings, that Yangte-Tali road condition is not motorable especially during rainy season and it’s dilapidated road condition is beyond repairable and therefore it’s fund requirement is at least Rs 50-60 Crores to complete this road project upto Kumey bridge” said Sorang .